Question: How old should I be to rent and operate the rented boat? Answer: The renter has to be at least 25 and anyone else who will be operating the boat should also be at least 25 years of age. Question: Can I rent the boat and use it at a different location other than Lake Hartwell? Answer: Unfortunately, our policy states that the boats may only be used at Lake Hartwell, and the boats may not be transported to a different location. Question: What are my responsibilities once I have decided to rent a boat? Answer: The renter should have knowledge or have had been instructed in the proper and safe operation of the boat, proper behavior of all occupants, and safety of other boaters. The renter is responsible for the fuel that is going to be used for the boat because it is not included in the rental rate. The renter also has the responsibility to not use the boat in a careless or negligent manner or allow any person under the influence of alcohol or a controlled substance to operate the boat. Question: What are the boat rental rates? Answer: Our rates are $300/day, we will give you a price break of $265/day if you are also renting our Lake House.  Learn more about our Lake House.